Function is how things work and form is how they appear. In the world of illusion created by us, appearance may not be in harmony with function. Functional nutrition focuses on how our nutritional balance impacts the quality of our lives as well as our longevity. 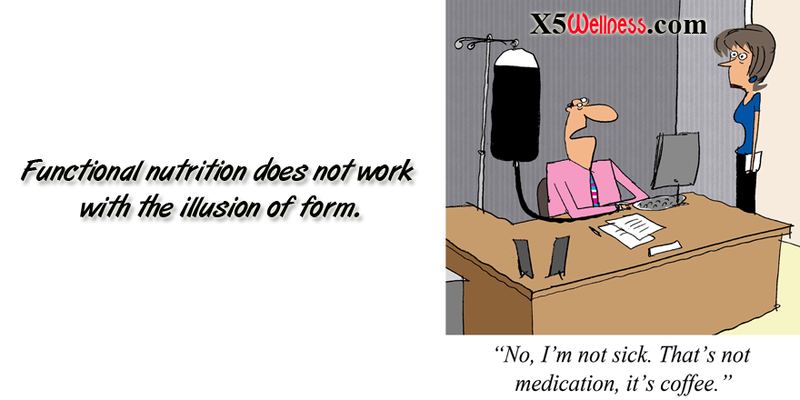 Functional nutrition does not work with the illusion of form. Our ability to pursue spiritual goals; the way we think, feel talk and act; how well we do in our personal and private life including the way, we love and play; our interactions with our family, friends and coworkers and our physical wellness and fitness and sports performance is part of functional nutrition. In today’s environment, it is close to impossible to get the nutrients we need to perform without functional nutrition planning. Any nutrition planning to be effective requires our direct input and record keeping based on the priorities we have for the functions in our lives.